As a freelance artist, Linda Wilmes has many accomplishments to her credit, along with numerous awards and accolades, as well as countless paintings in both private and corporate collections throughout the United States. 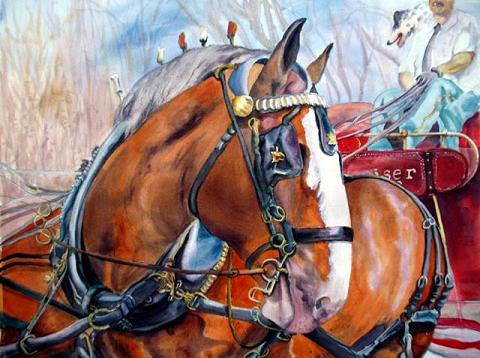 Working primarily in watercolor, acrylics, pastel and drawing, Linda's artwork explodes with vivid color, sparkling sunlight, and mysterious shadows. Light and color inspire this artist and challenge her with a disciplined character to capture the moment. The mood surrounding any subject may become a new and intriguing theme for a new piece. Linda Wilmes is a self taught artist from the rural Missouri county of St.Charles. Along with being an instructor of drawing and painting, she is also an accomplished muralist. Her most noteworthy works can be seen in the dome, of St. Joseph Church, Wentzville, MO., along with eight large canvas paintings of saints and angels. As an art instructor, Linda Wilmes teaches classes in watercolor, acrylic, plein air painting, and drawing. See more of Linda's artwork on her website. One of Eight by Linda Wilmes. Watercolor.Image Size: 15.5 x 19.5. $435.00. 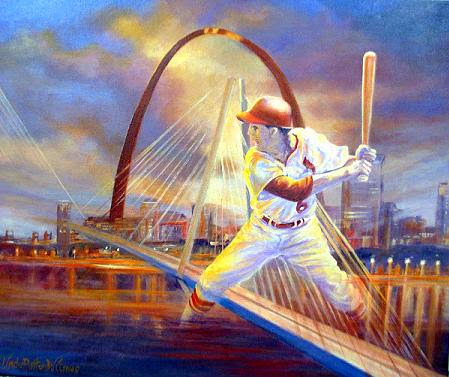 Pride of St. Louis by Linda Wilmes. Acrylic. Image Size: 20x24. $450.00.